Face and nose fractures can be caused by common trauma or accidents at home, at work, or during any physical activity. At the West Long Branch surgical practice of Dr. Boris Volshteyn, we provide treatments to restore the facial appearance of our patients. As a board certified plastic surgeon who specializes in microsurgery, he precisely restores the delicate structures that make up the face and nose. If you or your children have experienced trauma to the face or nose, visit Atlantic Surgical Associates today to restore your natural appearance. For patients experiencing a face or nose trauma, they should immediately seek assistance in the emergency room. However, many emergency room doctors are not specialists in treating these issues. The nose or face fractures may not heal in the best manner. This can lead to additional surgery being needed to correct aesthetic and functional issues. Visit our West Long Branch plastic surgeon, Dr. Volshteyn, for an accurate diagnosis and a personalized, timely treatment plan. Delicate areas like noses, cheekbones, and orbitals require immediate attention. We strive to treat these issues early to prevent unnecessary surgical treatments that delay the recovery period. 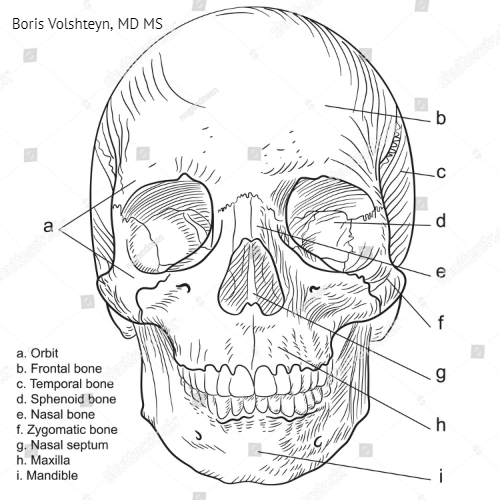 Dr. Volshteyn looks at the face fractures carefully, as their location can indicate more specific concerns. For example, the frontal sinus – which is on top of the nose, central forehead – is an airspace that protects the brain. If you have any indentations on the forehead, you may have sinus swelling and front sinus impaction. While some consider addressing these concerns as a cosmetic treatment, the care we provide can eliminate pain in the nose and forehead. In these and other instances, our state of the art technology and years of microsurgery experience helps us provide an extensive diagnosis. A common injury, such as a nose fracture, can be properly treated immediately. However, patients who have more serious facial fractures may need to wait a few weeks for a more intricate procedure. This will be determined upon the initial examination with Dr. Volshteyn which should still be sought as soon as possible following the initial injury. In some cases we can use the patient’s own skin and soft tissue to splint the bone fragments into proper position, maximizing a successful healing period. Unlike larger bones throughout the body, the thin bones in the nose cannot be held in place with metal devices. The tissue splints support the nose more successfully. Dr. Boris Volshteyn and the rest of the staff at Atlantic Surgical Associates strive to see patients immediately to ensure proper healing for a renewed natural appearance. For more information about our treatments, schedule a consultation today!